Now, a new analysis of about 10,000 normal Sun-like stars in the bulge reveals that our galaxy's hub is a dynamic environment of stars of various ages zipping around at different speeds, like travelers bustling about a busy airport. This conclusion is based on nine years' worth of archival data from NASA's Hubble Space Telescope. The Hubble study of this complicated, chaotic heart of our Milky Way may provide new clues to the evolution of our galaxy, said researchers. The research team, led by Will Clarkson of the University of Michigan-Dearborn, found that the motions of bulge stars are different, depending on a star's chemical composition. Stars richer in elements heavier than hydrogen and helium have less disordered motions, but are orbiting around the galactic center faster than older stars that are deficient in heavier elements. "There are many theories describing the formation of our galaxy and central bulge," said Annalisa Calamida of the Space Telescope Science Institute, Baltimore, Maryland, a member of the Hubble research team. "Some say the bulge formed when the galaxy first formed about 13 billion years ago. In this case, all bulge stars should be old and share a similar motion. But others think the bulge formed later in the galaxy's lifetime, slowly evolving after the first generations of stars were born. In this scenario, some of the stars in the bulge might be younger, with their chemical composition enriched in heavier elements expelled from the death of previous generations of stars, and they should show a different motion compared to the older stars. The stars in our study are showing characteristics of both models. Therefore, this analysis can help us in understanding the bulge's origin." The astronomers divided the stars by their chemical compositions and then compared the motions of each group. They determined the stars' chemical content by studying their colors and divided them in two main groups according to their heavy-element (iron) abundance. The chemically enriched stars are moving twice as fast as the other population. "By analyzing nine years' worth of data in the archive and improving our analysis techniques, we have made a clear, robust detection of the differences in the motion for chemically deficient and chemically enriched Sun-like stars," Clarkson said. "We hope to continue our analysis, which will allow us to make a three-dimensional chart of the rich chemical and dynamical complexity of the populations in the bulge." 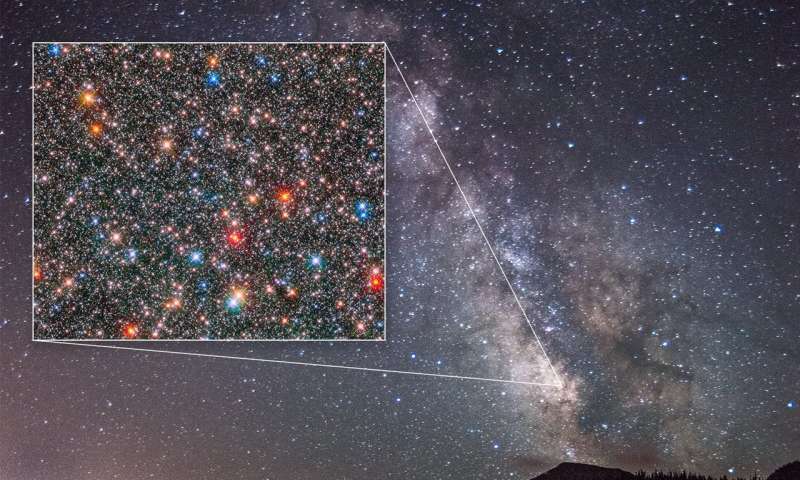 The astronomers based their analysis on Advanced Camera for Surveys and Wide Field Camera 3 data from two Hubble surveys: the Wide Field Camera 3 Galactic Bulge Treasury Program and the Sagittarius Window Eclipsing Extrasolar Planet Search. Sets of spectra from the European Southern Observatory's Very Large Telescope in Chile were used to help estimate the chemical compositions of stars. 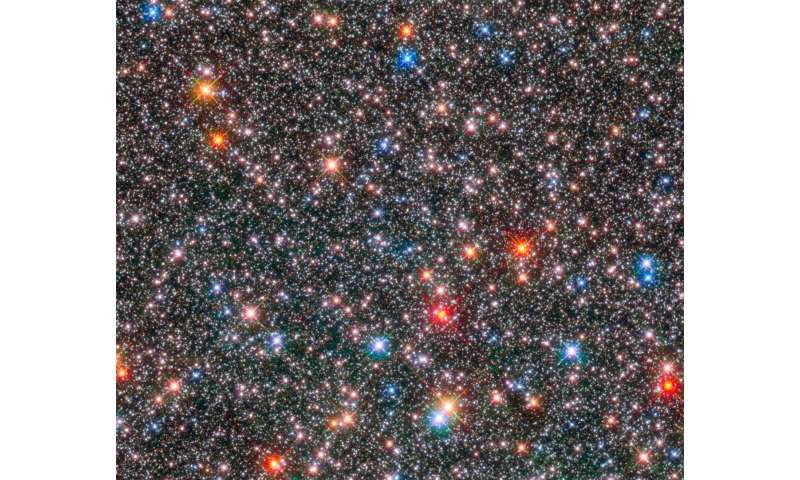 Currently, only Hubble has sharp enough resolution to simultaneously measure the motions of thousands of Sun-like stars at the the galaxy bulge's distance from Earth. The center of our galaxy is about 26,000 light-years away. "Before this analysis, the motions of these stars was not known," said team member Kailash Sahu of the Space Telescope Science Institute. "You need a long time baseline to accurately measure the positions and the motions of these faint stars." The team studied Sun-like stars because they are so abundant and easily within Hubble's reach. Previous observations looked at brighter, aging red giant stars, which are not as plentiful because they represent a brief episode in a star's lifetime. "Hubble gave us a narrow, pencil-beam view of the galaxy's core, but we are seeing thousands more stars than those spotted in earlier studies," Calamida said. The Milky Way's bulge is roughly one-tenth the diameter of our pancake-shaped galaxy. "We next plan to extend our analysis to do additional observations along different sight-lines, which will allow us to make a three-dimensional probe of the rich complexity of the populations in the bulge," Clarkson added. The researchers said that this work is also an important pathfinder for NASA's James Webb Space Telescope to probe the archaeology of the Milky Way. Scheduled for launch in 2019, Webb is expected to more deeply probe stellar populations in the Milky Way bulge. The research team will present its findings Thursday, Jan. 11, at the 231st meeting of the American Astronomical Society in Washington, D.C.